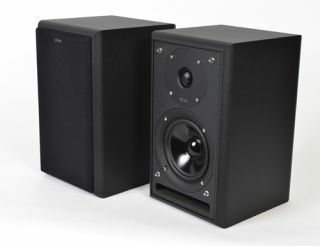 Eltax introduces Bluetooth version of Monitor 3 speakers | What Hi-Fi? The market for wireless speakers seems to be expanding by the week and Danish manufacturer Eltax appears to be keen not to get left behind as this trend continues to grow. An active, Bluetooth-enabled version of Eltax's Monitor 3 bookshelf loudspeakers has now been launched here in the UK, promising a "powerful, future-proof speaker system". A range of digital and analogue connections – optical, coaxial, RCA and mini-jack 3.5mm – form part of the Monitor 3 BTs, while a subwoofer output completes the line-up. The cabinet is an 18mm MDF construction, with a 25mm soft dome tweeter and 130mm mid bass driver loaded through a slot design port to the front found under the cover. A remote control also comes with the Monitor 3 BTs, which boasts a frequency response of 50Hz to 20kHz, a power output of 50W and a built-in digital signal processor. If you're thinking about removing the wires from your home set-up and have a Bluetooth-enabled device to play your music on, the Eltax Monitor 3 BTs are now available for £200.